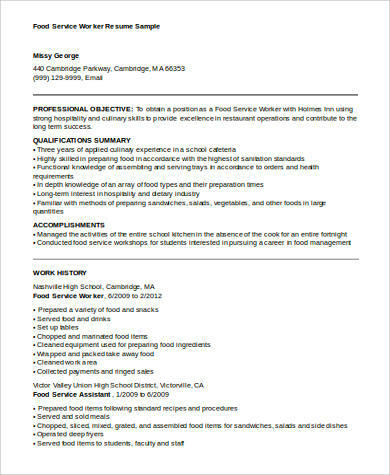 Being a food service worker requires you to perform a wide range of tasks primarily in preparing and serving of foods and beverages. 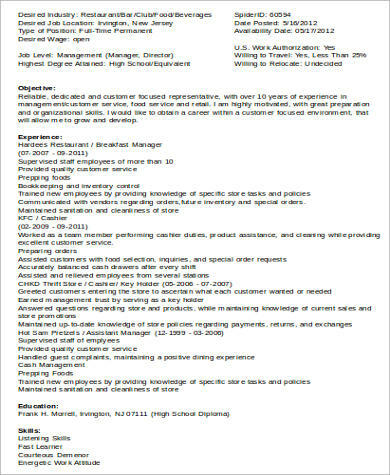 You are expected to be in a team of chefs and cooks who may require your services as their assistant. You should be willing and ready to perform tasks on short notice and will have to go overtime when necessary. 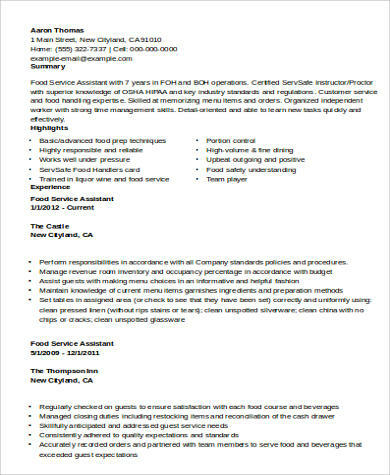 Our Sample Resumes have a wide range of food service worker jobs in different categories that applicants may find useful. 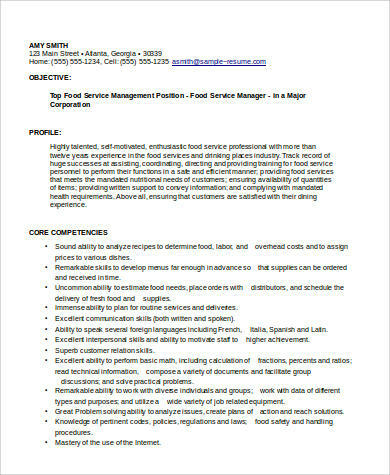 These range from hospital food service to food service manager depending on the applicable category. These are all free to download and print. Being a food service worker ensures you’ll be kept busy with several tasks assigned to you, from preparing menus to ordering food supplies and keeping tabs on the inventory. Since the job is pretty much generalized in terms of its category, you’ll be expected to handle a variety of tasks including cleaning the kitchen and the food equipment. It’s not uncommon for food service workers to play the role of waiters in high-end restaurants and servers in hotel buffets, so oftentimes it’s a premium to be able to know a lot of languages. There are places of work that require food service staff to have the ability to speak foreign languages to help develop a rapport with foreign customers to make them feel at home. 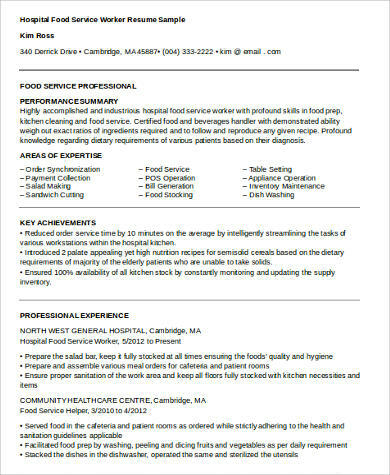 Our free downloadable Customer Service Resume Samples and Sample Food Service Resumes will help potential applicants know the different tasks, duties, and responsibilities that go along with their profession and what is expected of them. Being a food service worker means first and foremost being able to handle, prepare, and serve food. At the same time, the job entails a lot of physical activities because you’re not just relegated to the kitchen but at the restaurant itself, serving food and waiting tables. There are even instances when you’ll be assigned to cashier duties, handling payment and preparing bills for customers. It would be best to learn a wide array of tasks and get the best experience from your place of employment before transferring to other places of work. 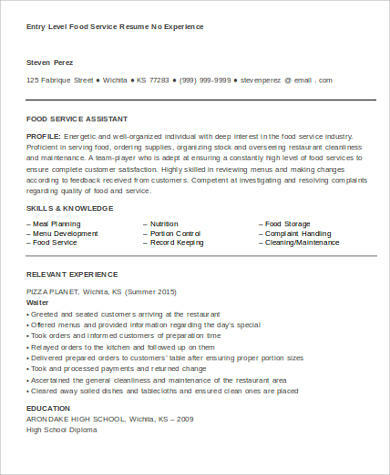 For specific tasks regarding restaurant duties, our website also offers free downloadable Sample Restaurant Resumes that potential applicants can scan and get ideas on how to craft their resumes. These can be edited and printed and available in either Word Doc or PDF file formats.